Tuesday night an enthusiastic crowd of about 125 people showed up in Largo for the formal launch of the No Tax for Tracks campaign. There were T-shirts, yard signs, bumper stickers, magnetic signs and more available for the No Tax for Tracks supporters. Attendees heard the No Tracks presentation from Barbra Haselden and some impressive motivation from members of the initiative’s team. 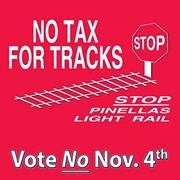 No Tax for Tracks is facing an uphill battle with the Sales Tax referendum being supported by the PSTA, the Pinellas County Commission and numerous high profile groups like the Chamber of Commerce. In Wednesday’s PSTA Board meeting, the Board was briefed on how to legally spend PSTA dollars “educating” the public about the Sales Tax referendum by the Board’s attorney. Brad Miller, PSTA CEO, indicated that there was already $150,000 set aside for communications, and Board members asked for the PSTA Budget Department to put together a plan and find some more money to be used in the campaign to get the Sales Tax referendum passed. Mr. Miller indicated that the real push to get the voters to actually vote for the Sales Tax Referendum will come from private supporters and PACs (Political Action Committees) and that effort is expected to start in February. The real question is even if the PSTA carefully constructs their “education” efforts so they comply with the law, is it morally acceptable for elected officials to use the public’s tax revenue to support an initiative that recent polls show over 50% of the people don’t want. Perhaps it is time that some “educating” of public officials begin that indicates there is a political cost for what the public may perceive as an inappropriate use of public funds to push a revenue generating referendum question. No Tax for Tracks faces as uphill battle as was pointed out in Tuesday evenings’ meeting, but as was also pointed out so have a number of other local government initiatives: the Albert Whitted Airport, the Rays Waterfront Stadium and most recently the St. Petersburg LENS and we all know how those turned out. The public won. Pay attention to this referendum battle. It is important. Read what you can and get input from both sides. See who supports what and what they stand to gain. If you can, go to some meetings and ask some questions. Your vote on this critical issue is important cast it wisely. e-mail Doc at dr.webb@verizon.net or send me a Facebook Friend Request at Gene Webb Prepared to vote NO on the Transportation Sales Tax Referendum.